This week, Hewlert-Packard released a new television ad for its Pavilion x360 — a notebook that turns into a tablet — made up of a continuous sequence of Vines. Marketing agency Niche invited Vine’s most popular users to participate in the ad. Vine, Instagram and now Snapchat stars are being paid well to build and influence sought-after audiences for brands. Marketers are realizing there’s value in targeting audiences, particularly the elusive millennial generation, through disappearing messaging apps like Snapchat and anonymous platforms like Whisper, Secret and Anomo — quite a change from today’s modus operandi of Facebook hyper-targeting. 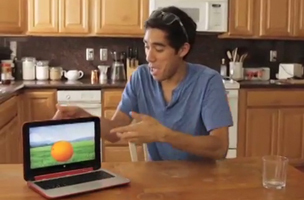 HP asked Vine-ographers Robby Ayala, who creates silly videos, to entertain his 2.8 million followers, and Zach King, whose visual trickery has amassed 1.7 million followers, for six seconds of creative story-telling featuring the Pavilion x360. The “#BendTheRules of TV Advertising with the HP x360” campaign is the first television spot created entirely of Vines. HP and others are trying to blur the lines between television and digital, but ratings growth has been declining on broadcast and cable TV since 2011, and both cable and broadband providers are having difficulty retaining customers. Mobile video and video consumption on SVoD services like Netflix, however, are booming industries. Futuresource Consulting expects the digital video market growth to reach 33 percent in 2014, exceeding the 25 percent growth expected this year.